First, this is not an encyclopedic history of USAF interceptors. This book is a photo book spanning the years indicated. If you're a "show me the pictures" kind of person, this is for you. The authors provide a concise history of US territorial defence organization, descriptions of the major fighters and interceptors, plans for other aircraft not pursued and plenty of photos. After WW 2, the defence needs of the US and every major power changed. The long-ranged bombers and nuclear weapons meant no country was completely safe. This meant the US needed to secure its airspace as it never had before. I had presumed this would be straightforward and relatively simple. I was wrong. The period starts before the formation of the US Air Force. The WW2 vintage P-61s were unsuitable for intercepting new, fast, long-ranged Soviet bombers. These were soon retired in favor of the much more capable F-82 for radar interceptor and P-47s for general patrol. After the USAF was formed, the situation became a little more clear. 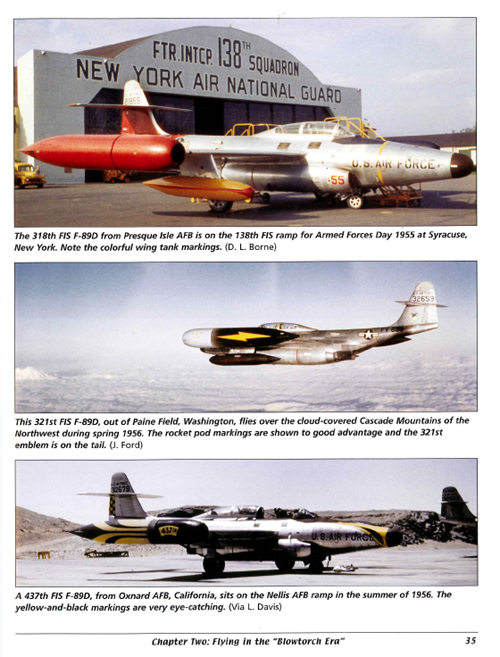 The book relates deployment of many aircraft types through the “blowtorch” era of fighters, the F-80, F-84, F-86, F-89, F-92, F-86, F-94, F-4, and through the iconic Century Series fighters. An interesting point I hadn’t really considered is the relationship changes when units were deployed overseas and on US territory. Of course units rotated service frequently, and the roles occasionally changed. The Air Defence Command evolved over the decades, as did the tactics and structure of its fighter squadrons. 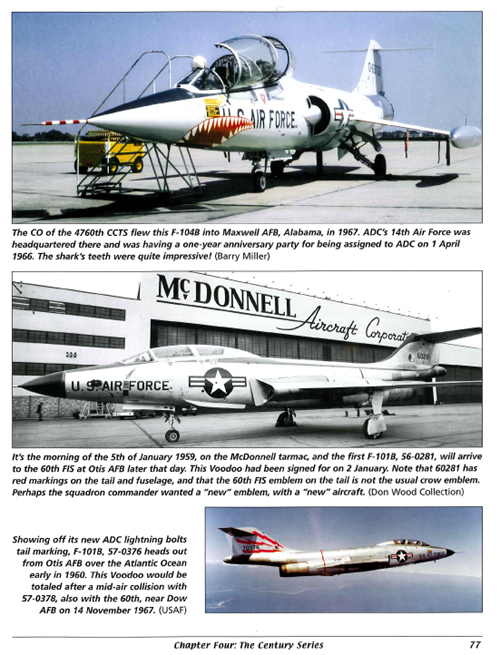 ADC ended in 1979, when a more modern combined aircraft structure took over. But in the glory days of US interceptors, ADC was the name of the game. The book also dedicates some space to the support aircraft, like trainers, laiason and controller aircraft. These types allowed skilled pilots to operate efficiently and professionally with other services and nations. The book also dedicates a little space to five “might have been” interceptor concepts. As primarily a well-captioned picture book, USAF Interceptors succeeds quite well. I’m a fan of this era and there are a lot of pictures I’ve never seen. Some of the color schemes are gaudy, some quite odd to the contemporary eye, and some are downright unattractive. But they’re all very interesting in historical and a model-building contexts. In-flight beauty shots are interspersed with deployment and field maintenance and airshow pictures. The book has a lot of color pictures and many of the black & white images have color information in the captions. As a modeler, this is invaluable. It makes painting a hitherto-unseen aircraft for a model show possible. Since many of these aircraft are bare-metal, the book provides some very interesting weathering and coloration references. What’s here for the Science Fiction modeler? At first consideration I’m tempted to say not much. On second thought, there are a few things. First, if you are interested in conjectural or alternate aircraft, there are some great squadron marking and color schemes here. For instance, if you wanted to paint an F-90 as an operational jet, you have some great choices. Second, this is the great monster movie era and you can really play with these fighters and UFOs or Kaiju. Third, the fighter concepts have value of their own. Some of these will give you great kitbashing ideas, though there are plenty of books on US fighter concepts. USAF Interceptors is a great picture album interwoven with concise history. At its $25 MSRP I think it’s a great value even within Specialty Press’ catalogue. This page copyright © 2010 Starship Modeler. First posted on 11 August 2010.